Lots of things happened over the weekend. 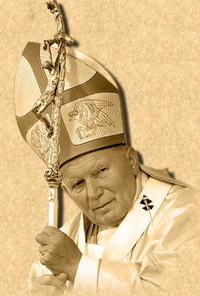 The most notable event was obviously the death of Pope John Paul II in Rome. On Friday, while the Pope was reported to be near death, I got a phone call from a woman complaining that we were doing too much coverage on the Pope.... that he wasn't the leader of her church..... that she didn't worship him.... and that she was angry that we were giving, and would give, so much of our television time and effort to the impending death of one man. First, I reminded her that she wasn't required to watch. Then I reminded her that this man headed a church that counted well over a billion members.... that one in every four Americans is Catholic..... that, in some countries, virtually the entire population is Catholic.... that other Christian religions had their roots in Catholicism..... that John Paul was a charismatic spiritual figure whose influence reached far beyond the church...... and that leaders of all nations and religions were expressing sadness and concern for his (then) failing health. Pope John Paul II leaves behind a legacy of worldwide influence far beyond that enjoyed by many heads of state, even presidents. He will be remembered as an important figure in history, beyond the realm of religion. He played a significant role in the fall of communism around the world, and was often a calming voice for peace -- sometimes seemingly the only one -- in times of war and conflict and inhumanity. He even spoke for the humane treatment of animals. In truth, whether you're Catholic, Protestant, Jewish, Islamic, Buddhist, a non-believer, or whatever, John Paul has touched your life in some way, directly or indirectly. On Friday, I told my caller that -- while I am not Catholic -- I believe that this is TV time properly spent.... from a human angle, and from a news angle.